Years of experience and knowledge in cardiology to serve you. Dedicated to Clinical Cardiology, Interventional Cardiology and Peripheral Vascular Disease. Our practice is dedicated to Clinical Cardiology, Interventional Cardiology and Peripheral Vascular Disease. We provide medical care for Blood Pressure & Cholesterol Control, Cardiac Risk Factors Assessment for the Prevention of: Stroke, Heart Attack, Vascular Disease, Congestive Heart Failure, Syncope and Sudden Cardiac Death. We’ve invested in advanced, state-of-the-art equipment for heart screening services. This enables us to detect possible problems early enough to manage or even prevent heart disease. AICC is an accredited testing facility. So you stay here for screenings, which saves you time and enables us to get results faster. 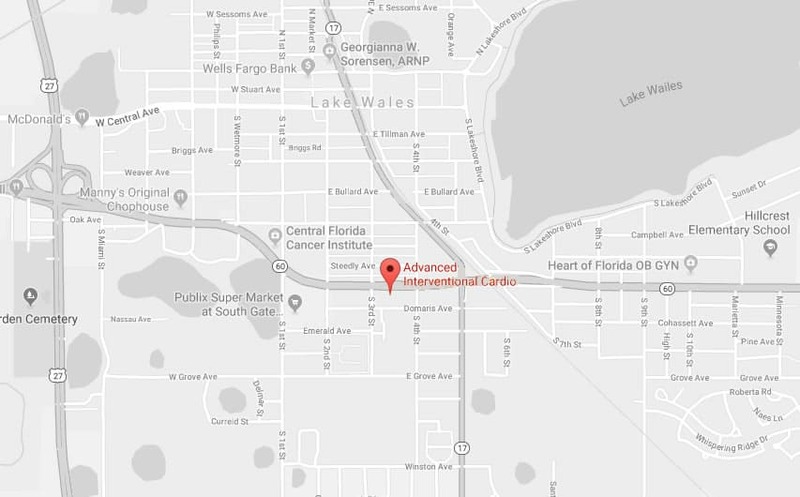 We are located in the City of Lake Wales in Polk County, Florida, just a few minutes from Winter Haven, Frostproof, Bartow, Haines City and Davenport. Your heart is your most critical muscle. And it's also the most hard-working. It ticks every day no matter what you are doing - sleeping or relaxing - it's still working for you. The adult heart beats around 100,000 times each day. For non-athletic adults, the beat-per-minute rate is 60-100, but for athletes it's 40 to 60. Heart disease isn't only the number 1 killer of men, it's also the top killer for women. According to the American Heart Association, more than one in three women is living with heart disease. A healthy heart is about the size of a person's fist. But congestive heart failure can cause a heart to enlarge. Want to be healthy for good? As the saying goes; an ounce of prevention is worth a pound of cure. For great information about healthy living and your heart, please visit the American Heart Association's website "Healthy for Good". Finding, treating and preventing diseases of the heart and blood vessels. © 2018 Advanced Interventional Cardiology Consultants All Rights Reserved.